Ordinarily we see vases as a decorative piece with flowers in it and placed on top of the table. Actually vases are more than just flower pots. They’re not just any small container to hold on flowers. The vase itself can be the decorative piece. These vary in sizes and what’s new is that these are also placed in a corner and take the place of furniture that’s why floor vases were created. Uniquely designed and created, apart from being attractive, decorative and a holder for plants or flowers, it is a high quality product which sustains water and nutrient to the plant for 120 days! So neat! 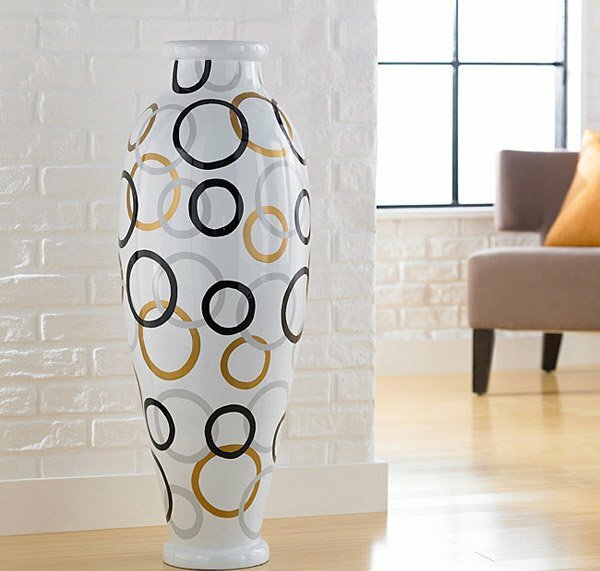 If you love clay pottery then this clay work floor vase is the best for you. Not only that this is tough and durable, this vase was hand crafted and hand painted. The neck is wrapped with rattan for a contrasting look. Bring vintage style into your interiors with this fascinating Terracotta Mosaic Vase. Vintage as it is but with its simple design, it can easily blend even with modern decor and interior. A contemporary designer floor lamp in black and white vertical stripes. 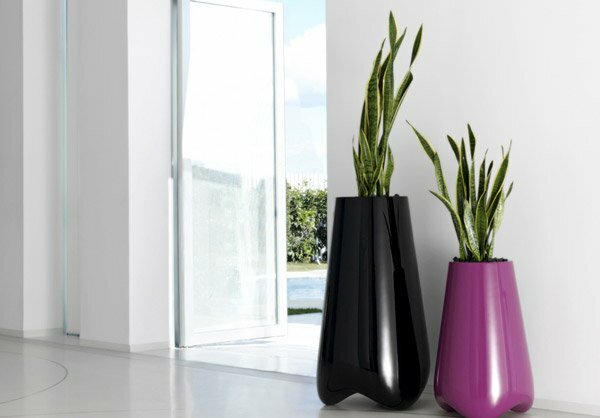 The vase flaunts a long and slender body ideal as a decorative item on its own. 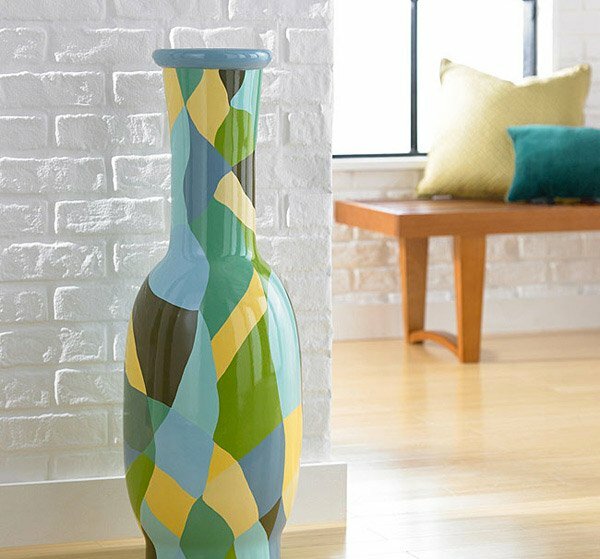 Add personality and style to your room with this decorative vase in subtle variation of colors and inspired by the colors of the earth and sky. 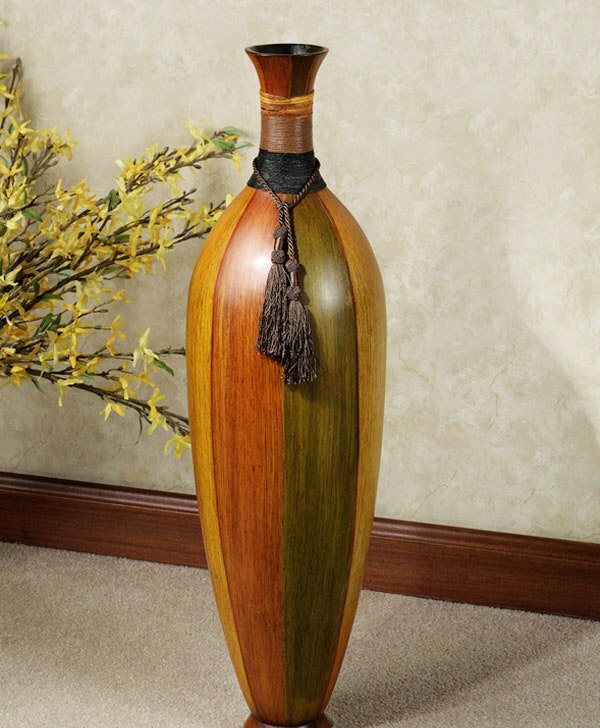 A set of large vase crafted from natural bamboo, this attracts a dramatic impression. Thanks to its unique size, texture and shades. 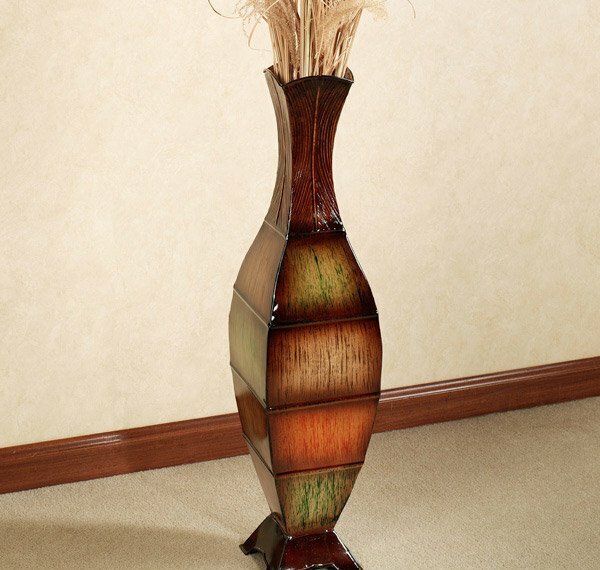 This small vase is perfect for showing the beauty of bundled branches, bamboo or flowers because of its round shape and organic color. But of course in absence of those, this is a perfect decorative place. 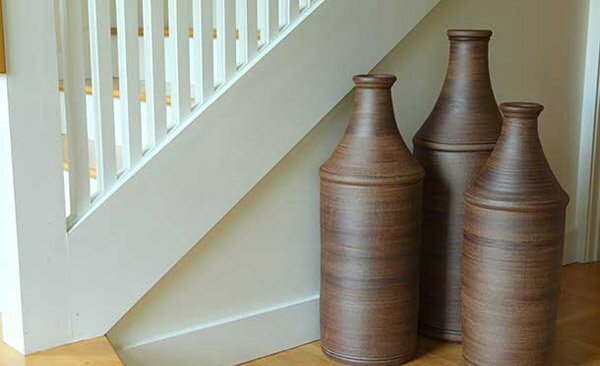 Have these trio classic bottles sit around your corner or on your foyer to add accent and add a touch of class and character. An amazing geometric floor vase which was hand-painted and is sturdy enough to support long branches and other nature-inspiring accents. 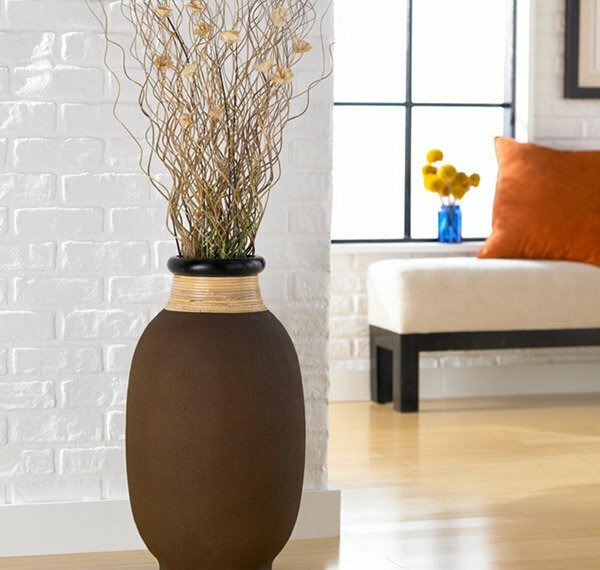 The lavish and shimmering Karman Floor Vase will make a stunning accent which features sections of brown, mocha, terra cotta, and teal green. This can hold some foliage or be a great display alone. 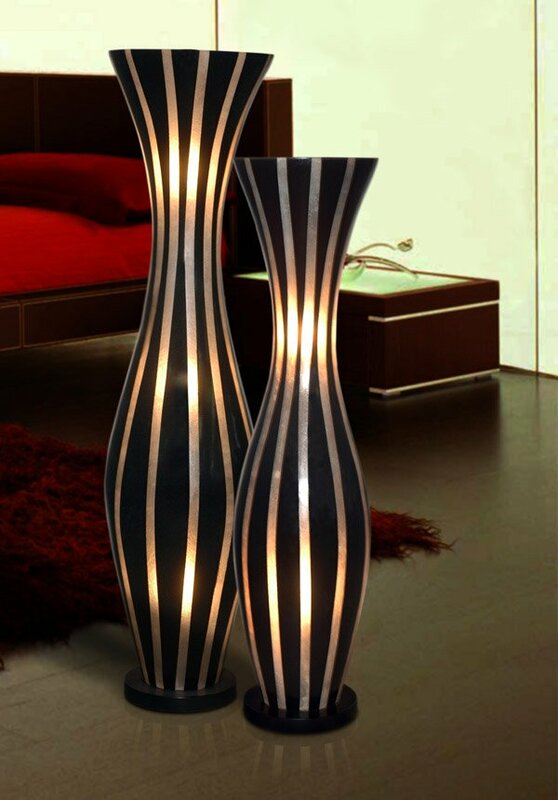 A definite work of art and showpiece on its own, this tall, durable and hand-shape vase painted in midnight black with bold streaks of gleaming copper, is a pronounced highlight anywhere in your interior. 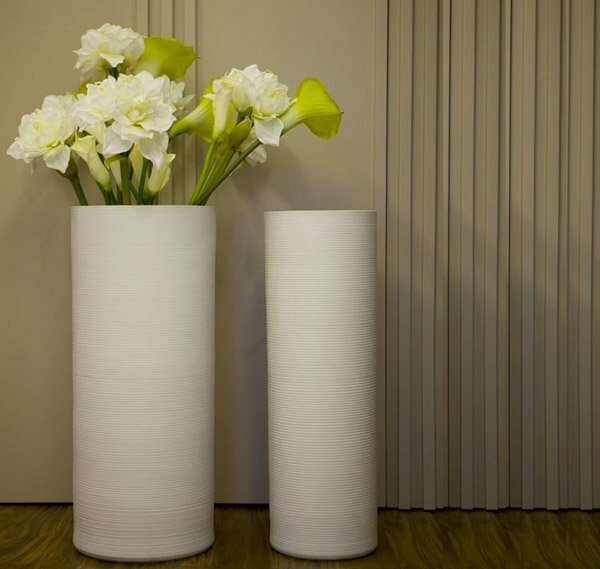 Crafted from quality ceramic and designed with glaze pearl white stripes, this stunning vase blends in with different kinds of your home decor and is highly stylish and functional whenever you fill them with blooms, grasses or branches to create seasonal display. You’ll be proud to display wherever it fits. 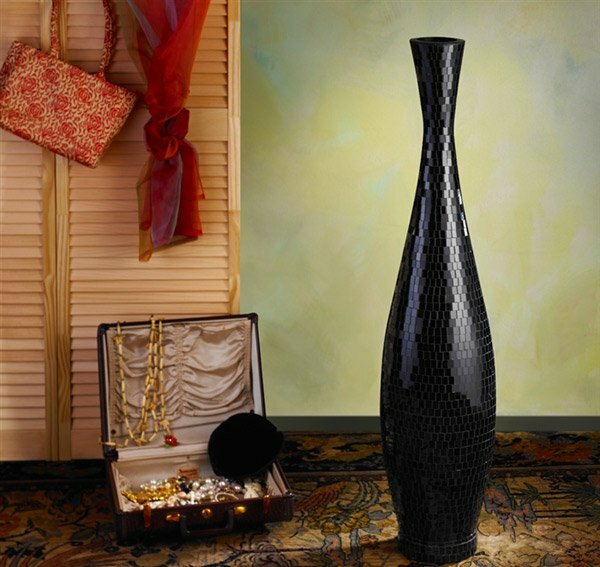 Just like any other vase, this Black Trumpet Mosaic Floor Vase sets no limitation as to where it can be placed. It is captivating either on your foyer, corner or at the side of any furniture because of its rich, glossy black color and mosaic texture. 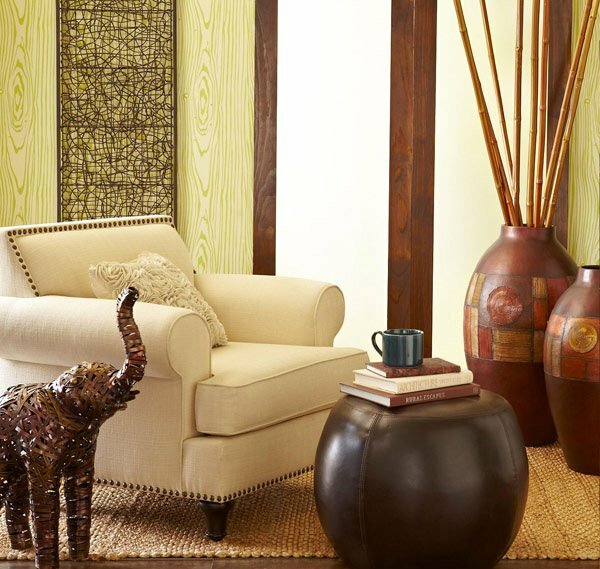 An earthy vintage which showcases vertical colors of moss tone green, sierra, terra cotta, and maize and a rattan wrap. A tassel accent is added around its neck making it perfect for your vintage scheme yet suitable as well even for a modern interior. Who says floor vases should be gigantic? A decorative vase of deep, dramatic black with rope wrapped around its neck is perfect for creating a lively accent. It is actually made up of actual rice husks separated from the grain. 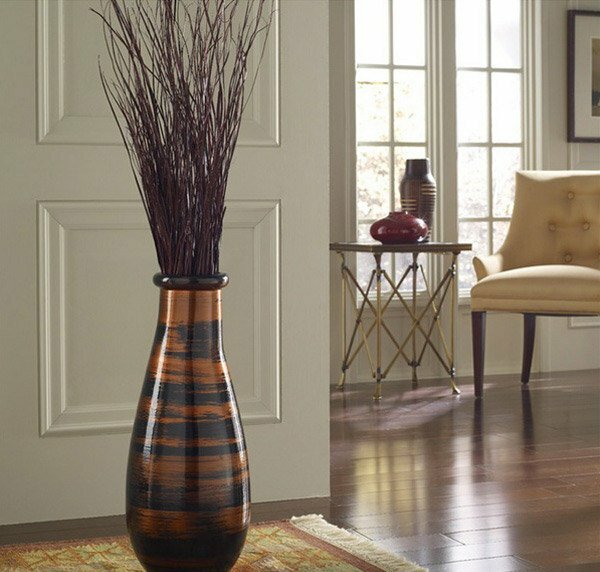 Either you place a dramatic vase around your corner or at your entrance, it can really catch attention and be a focal point. 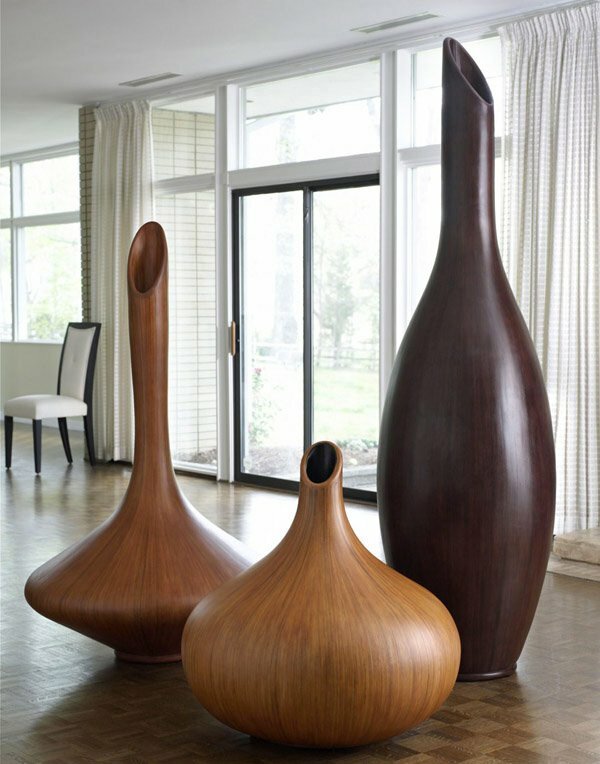 Choose floor vases which doesn’t limit itself to particular area hence it is flexible enough to be captivating. 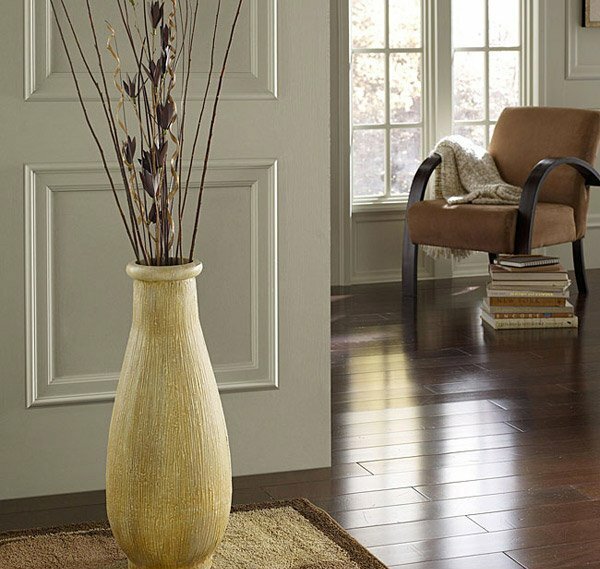 Choose floor vases which can carry itself and can give consistent beauty and sophistication. That would be it for our 20 Floor Vases and watch out for upcoming features here in Home Design Lover. You can also check on create animal inspired vases which can surely entertain you.